The Washington Post Magazine Hosts First Urban Safari in D.C.
WASHINGTON, DC--(Marketwire - May 13, 2008) - The Washington Post Magazine on May 18th is hosting thousands of people from around the world to solve Tom Shroder, Dave Barry and Gene Weingarten's internationally renowned and exhilarating brainteasers in an event called Post Hunt, the first Washington, D.C. urban safari. The celebrated humor writers and creators of the popular and captivating Miami Herald hunts in Florida are introducing this engaging game of visual puzzles to D.C.
"We've been doing this for 25 years in Florida with the Miami Herald," said Gene Weingarten, Washington Post Magazine Reporter. "Every year thousands of people come to take part. It's about time we brought it to Washington." The trick to solving these brainteasers is to figure out the number that is being represented. "For example, on the beach in Miami we hired sand sculptors to create three giant sculptures," said Tom Shroder, Washington Post Magazine Editor. "When people arrived, they found a sandcastle fort and a sandcastle house next to a pile of sand. So the answer was 'fort,' 'house,' 'sand' -- 4,000." Individuals or teams need only bring a copy of the May 18th Washington Post Magazine, which holds the puzzle clues, to Gallery Place in Chinatown. The first three groups to solve every puzzle will win prizes, the top prize being a vacation package (airfare, hotel included) to Westin Diplomat Resort and Spa in Fort Lauderdale, Florida. 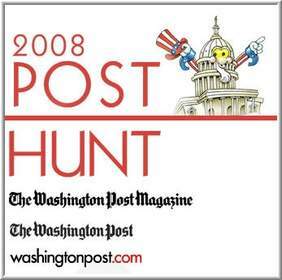 washingtonpost.com offers interactive tools and information to learn more about Post Hunt. In a video interview, the creators of the game explain the origins of the Hunt and how it's played. A virtual online hunt provides practice for some of the wacky, weird puzzles that readers will encounter on game day. There's an FAQ page, plus, on Tuesday at noon, the Post Hunt creators will be available on washingtonpost.com in a live discussion to answer reader questions. On May 19th, washingtonpost.com will feature an interactive, post-event package. Participants can share their Post Hunt photos online and comment on their experiences. The Hunt puzzles and their solutions will be recreated online, in addition to a video highlighting the event's most exciting moments. Participants planning their day can also use washingtonpost.com's City Guide to get information on the best area restaurants for lunch, dinner and cocktails. - Date/Time: Sunday, May 18th from 12:00 p.m. to 5:00 p.m.
Tom Shroder, Dave Barry and Gene Weingarten introduce the 2008 Post Hunt.